Pink roses have a long history in painted art; they are found in Pompeiian frescoes (c.50 BC to 79 AD), on the borders of illuminated manuscripts – with both decorative and symbolic functions – and in paintings of the Virgin, where they are emblematic of her beauty and innocence. They are also an attribute of Aphrodite, supposedly having been born on the same day as the goddess of beauty: Botticelli paints pink roses in The birth of Venus. Still life paintings containing pink roses can be found by the Spanish Zurbaran, by many 17th century Dutch artists, and – perhaps especially – in the work of 19th painters. 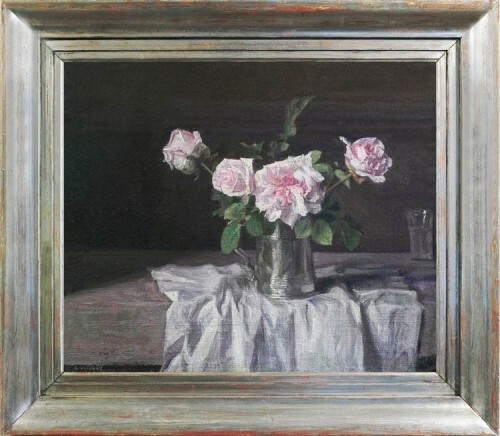 Manet, the Scottish Samuel Peploe and the American, William Merritt Chase, all painted pink roses; but the master of them all was Fantin Latour, whose exquisite studies of flowers in various types of vase, against dark and light grounds, may well have been in the mind of Weissbort when he began this attractive and beautifully composed still life of pink Alba roses.